All sands are not created equal. No one knows an exact number of the different types of sand, but even looking at just horse arenas there are hundreds of types of sand to choose from. The most important choice you can make when designing your arena is the type of surface you will be riding on. There are of course different disciplines and personal preference to consider when choosing your arena footing. It is highly recommended that a long lasting stable sand is selected for nearly all riding disciplines. The type of ride (e.g. deep, hard, shallow, stable) can and should be managed on an on basis. The type of sand chosen will dictate a large portion of the riding surface characteristics, but even the best sands can be mismanaged and not perform adequately. It is recommended that a sub angular or sub rounded sand be chosen. Your sand provider should be able to provide this very basic information for you. Some good rules of thumb are to avoid “manmade” / crushed sands as well as river sands. The “manmade” sands will be very “fresh”, ie angular, and all those sharp edges are both more abrasive on your horse’s hooves and have a tendency to break off and become dust. These “manmade” sands will also have a tendency to pack more and create more need for maintenance. River sands are the opposite. The long journey of sand from mountain tops to the river bottom wears down the corners and rounds the edges. This will make river sand of the right mineral content very long lasting and create lower amounts of dust, but will be an overall looser and deeper ride. This may be your preference and is an acceptable choice. Sub angular and sub rounded sands are somewhere in between. They have a tendency to not be too deep or to compact as readily. With diligent studied maintenance these sands can be handled to provide a tailored riding surface that fits your riding preference. 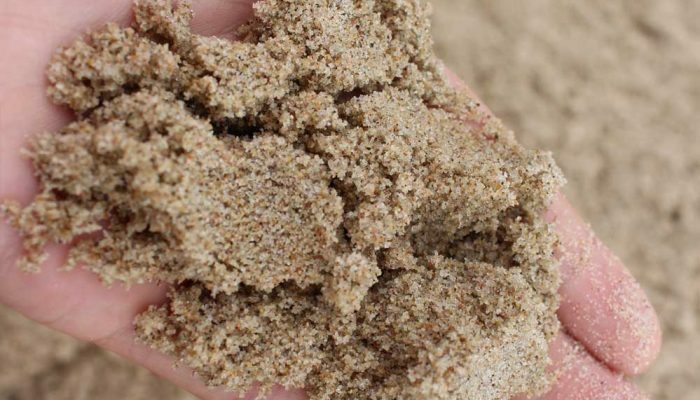 Particle size is also incredibly important when selecting a sand for your riding arena. Before we cover particle size however, let’s discuss how to look at a sieve analysis. Sieve sizes are an indicator of how many “holes” there are in a screen per square inch. So, something with a sieve of 60 has, let’s say 60 holes per inch and sieve of 120 has 120 holes per inch. The actual number of holes is not directly related to the sieve number, but the relative size of the holes is linear as described in this example. In order for a 120 sieve to have 120 holes in the same area as a 60 sieve the holes need to be half as large, thus allowing only smaller particles to pass through. The smaller the sieve number, the larger the particles and the larger the sieve number the smaller the particles. Now, when selecting an acceptable particle size profile there are a few things to consider. Larger particles, regardless of angularity, will ride more deeply than small particles. Classified sands with a very tight spec of particle sizes will also tend to ride more deeply than a spec that covers a broader spectrum of particle sizes. Particle sizes smaller than a sieve of 120 should be avoided and a large amount of material that ends up in the “pan” on the sieve analysis means dust. A sieve analysis that shows an even mix of particles ranging from 18 to 100 should make for an ideal arena surface for most disciplines. We will again emphasize here that the quality and consistency of your horse arena footing does not stop when you have selected your surface. Moisture levels, additives, drainage, and maintenance regimes all play an important role in the characteristics of your riding experience. The biggest thing to know about sand is that there are hard minerals and soft minerals. This has been defined by geologist and put in to a scale called the “Mohs scale of mineral hardness”. Softer minerals are more easily broken down and breakdown of your sand means DUST. The hardest mineral that is commercially, and affordably, available is quartz (SiO2) with feldspar (commonly KAlSi3O8 or NaAlSi3O8 or CaAl2Si2O8) coming in a close second. These should be your main focus when looking for quality sand. In most of the sands available in the USA lighter colored or clear particles indicate a high quartz content, darker flat particles are usually an indicator of mica which falls near the bottom of the scale and can easily be crushed between your finger nails. Be careful to not base your assessment solely on the basis of color. Minerals come in all shades and the quality cannot be assessed at a glance from afar. The take away is that softer minerals will breakdown more quickly and cause dust. Understand the type and percentages of the minerals in your sand before committing. You wouldn’t think that the size and shape of sand would be a big deal in a riding arena, but it has a huge impact. The shape of the particle of sand is the most important aspect. A round sand particle will create a rolling effect in the footing and will never compact because all of the sides of the particle have been worn off. It will move easily, allowing your horse to slide in the ring. If you choose a particle with sharp edges, it will compact with itself and become hard. If you choose an angular particle, it will provide both cushion and stability. Angular and Sub-angular particles are the most popular shapes of sand. They’re going to offer the most resistance to movement between the particles, prevent rolling but will have enough “give” for a cushioning effect. It is important to define terms. For the purposes of this section dirt is defined as particles smaller than sand, usually containing a high level of organic content. This smaller particle size and organic content makes dirt extremely moisture sensitive. This has the effect of making an arena wet and sloppy with too much rain, and dry and dusty from a few days of sun. Another issue with a dirt arena is that it packs easily. As discussed in the sand sieve analysis section of this website smaller particles will have a tendency to pack more and dirt, silts, or clays all consist of very small particles that will, over time, pack. Arena footing that has packed is harder to maintain and less consistent have the added disadvantage of being a less safe riding surface for your horse. Though a dirt surface can be maintained, it tends to be more maintenance intensive and weather dependent footing than other options. Rubber can be used as an additive to sand footing. Rubber should only be used as an additive. It should not be used alone in an arena. There are websites promoting rubber footing at one or two inch of depth, but the reality is that it is dangerous alone. The larger particle sizes are unstable loose surface and tend to be too deep and to roll. The deep footing can cause strain on your horses’ legs and tendons. Rubber can, however, be used effectively as an additive to your arena footing. The larger particles can help to limit packing and reduce the amount of wear on the sand particles. It is recommended that the percentage of rubber is increased slowly over time until optimum riding conditions are obtained. It is possible to add rubber to an existing footing, but very difficult to remove rubber once integrated. When selecting a rubber source be sure to receive samples of the material before committing to buy. Not all rubber recyclers produce the same products or even use the same types of rubber sources. Though metal wire is present in passenger tire (the main source of all rubber in the USA) tire recyclers sell this metal as a bi-product and are incentivized to remove as much of the metal as possible. Clean, metal free, rubber can be obtain, but be sure to request samples before ordering. Wood is often a popular product when it comes to arenas. It can be used alone or mixed with sand. A wide variety of wood products are seen in arenas including shavings, sawdust, hogfuel, chips, shredded bark and shredded fibers. Wood is often mixed in with sand to help with dust. Wood can hold moisture in the footing, therefore helping with dust issues; and can also slow down the breakdown of sand particles. One drawback to the use of wood as an additive is that it needs to be watered often. The wood cannot dry out or it will lose flexibility and break down quickly creating more dust. Another issue is that wood does decompose in a relatively short time period so you will need to add new material often to your arena. The good news about this is that wood is readily available with low costs. Be sure to understand the source of the wood product you are purchasing, there should not be any trimmings from trees or metal objects in the wood from factories that could harm horses. Wax-coated sand is often referred to as synthetic arena footing and is a well established option on the market. This footing is primarily sand based and offers cushioning, traction, and is dust-free. These footings will also contain a mixture of fiber and/or rubber. The combined effect of the sand, rubber, fiber, and wax is an integrated root system with a synthetic permanent moisture content that both stabilizes the surface while also eliminating dust. The fiber in the formulation acts as a root system that both creates stability in the arena footing while also keeping the surface loose and cushioned. The rubber acts to decrease compaction, as well as reducing the wear on the sand particles. Finally the wax coats all of the other components and provides synthetic moisture that will last over 10 years. This moisture helps to keep the fiber and rubber in suspension, maintaining the integrity of the footing, and also binds with any small dust particle, thus eliminating the need to water. However, not all synthetic arena footing manufacturers have the same formulation. It is highly recommended to obtain sample of the material that will be produced and to check references. Waxed arena footings are a higher upfront cost, but substantially increased longevity, lower maintenance costs, and increased health benefits and safety factor for horse and rider. The price of coated sands/mixes can be between $3-$8 per square foot, depending on your location and the depth of the footing required. These prices normally also include an installation with the footing. Organic matter such as manure, leaves and bedding should removed from the footing regularly. What Can Be added to sand? When you have chosen your primary footing and have ridden on it for a while you may notice that it moves too much, or needs some more of a bounce. It could be time to consider tweaking your footing with an additive to produce a desired effect. There are two options of material for additives: Rubber or/and fibers. Rubber additives are added to footing when you are looking for more cushion when working your horse, perhaps when jumping. Rubber additives are generally made from recycled tires or industrial scrap rubber. These can be either a granulated product or a flat chip. When deciding between the granulated or the flat rubber pieces it is best to look at what type of sand is used. If you have sand that contains fines or stone dust and you want to reduce compaction, you’ll want to use the granules. If your sand is clean sand, you’ll want to choose the flat chips. Clean sand is normally pretty loose material, adding the granules to this could create a deep mess that would not benefit your horse. Be cautious when adding rubber to your arena. You need to be sure that you don’t use too much, this will create an undesirable surface by increasing the density so much that the horse can’t grip it. The rule of thumb when adding rubber to your arena is one pound per square foot. This can cost anywhere from $1300 to $2600 depending on what size your arena is. Fiber additives are more popular in Europe but are making their way to the United States. Fibers are in either the natural category or synthetic category. Examples of natural fibers are burlap and cotton, and synthetic fibers can be nylon or polypropylene. Fibers interweave with each other and create a web-like surface which then creates a stable and consistent footing. Fiber is mixed in with sand footing and not used alone. The rule of thumb for fiber is the same for rubber: use about a pound per square foot. Adding fiber to your arena can cost anywhere from $2000-$4000 depending on the chosen fiber and the size of your arena. In our trucking section we talked of how there are a few different options for delivery. Footing components can be brought in separately and then mixed on site at your facility. A second option can be that your footing will be brought in large industrial bags or in bulk shipments. The last option is that it could possibly be sent on a train based on where you are located in comparison to the footing manufacturer. Please see our trucking section for a full description. Can you try and name all of the individual horse disciplines there are? It would definitely be a challenge. Even though there are numerous disciplines, each discipline has specific footing characteristics to keep the horse performing their best at each job. When it comes to Jumping, your footing should be around 3-4 inches. You don’t want it too deep where it won’t support the horse when taking off, but you don’t want it too thin to not support the horse when landing. The surface needs to be firm, yet supportive. Rubber products and fibers are often used in this footing to give it the characteristics that it needs. Dressage or flatwork and even barrel racing is recommended to have 2-3 inches of footing. This footing needs to be a bit springy to give the horse some bounce when working and have some traction for the horse to be able to not slide on the footing. The Reining discipline or other western disciplines such as Cutting, typically has deeper footing; which does allow the horse to slide on the footing. This footing needs to be 4-5 inches deep and is normally composed of sand or dirt mix. Depending on what type of facility you have, you will need to get certain types of footing based on how many horses are on the arena per day. There are commercial facilities that have more than 50 horses on the arena per day! These types of arenas need to understand that they will need to groom more often and should have a supportive footing with a long longevity. This footing is going to take a beating from having so many horses on it. It needs to be able to take this much activity and not break be broken down. Look into footing that has a long life span. It is important to find references that have this footing installed with similar environment as your commercial facility. Ask how long they have had the footing and how often they need to groom it. Following the footing maintenance guidelines is crucial to having the footing last. A private barn does not need to worry as much about this. They still should be sure to check all references of the footing that you are buying and see how often they need to groom and how many horses they heave each day on the footing. Obviously any footing that you buy, you want to last a long time. You don’t want to buy footing that has to be replaced in two years. Longevity really depends on what the footing is made up of and how much activity is on it. Let’s take a look at a few reasons why it may not last long and what to do if you have to replace your footing. As spoken about in the additive section, you will need to choose between natural fibers vs synthetic fibers. Just to recap, fibers are used to give the footing more support. The fibers will interweave with each other and create a stable, lattice-like surface. Natural Fibers are normally burlap or cotton fibers. Although natural fibers can work great, they break down much faster than synthetic fibers. Natural fibers are often chosen because individuals are under the impression that synthetic fibers cause environmental problems. Synthetic fibers are either nylon or polypropylene. Synthetic fibers do not pose any threat to the environment in an indoor or outdoor arena. If you want to save money and not have to add more fiber over time, the best choice is synthetic fibers. Take a look at the suggestions for disposing of your old footing! No matter what kind of footing you have, you may need to replenish it at some point. Synthetic footings can go longer periods of time without replenishment, but sand on the other hand will potentially have to be replenished almost yearly. Footing loss can occur when sand is pushed out of the arena by grooming, lost in erosion, can be tracked out in your horse’s hooves, or pulled by riding towards the exit. There are plenty of ways that the footing is lost out of the arena. Most of the time you can contact where you purchased the footing and they will have your account on file and tell you exactly how much you may need. It’s important to continually monitor the footing depths thorough the arena every few weeks or once a month. It is suggested to paint the bottom part of a measuring stick with the correct footing depth, and check the arena in various spots regularly. You can focus on where the footing is getting pulled from and pull it the opposite way. This will ensure you keep as much footing as possible in the arena, and make replenishment a thought in the far future.